Sunglass, which is coming out of beta today at TechCrunch Disrupt New York, should bring a bit of joy to longtime CAD users and professional architects and designers. 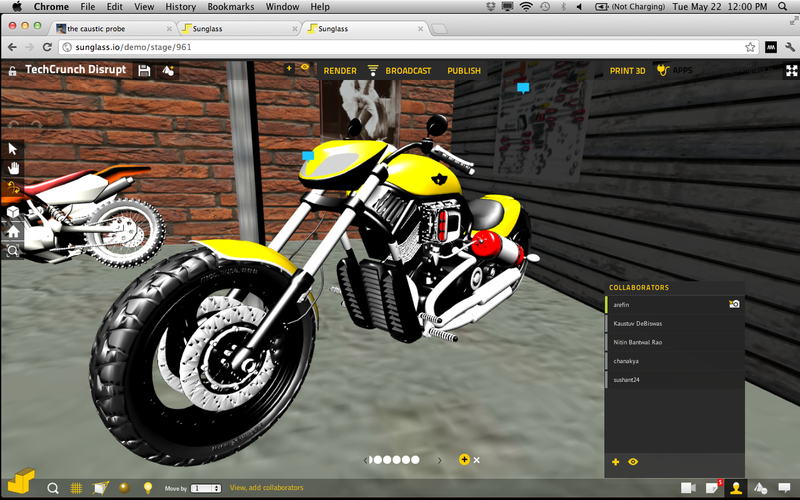 The company is launching very social, browser-based software for 3D modeling. “This is like Google Docs for 3D objects,” said CEO and co-founder Kaustuv DeBiswas. “We’re taking traditional desktop software from the architecture world and putting it in the cloud.” Sunglass is undercutting existing computer-aided design software dramatically. Normally, this older software can cost anywhere from $5,000 to $50,000, he adds. In contrast, the most basic version of Sunglass is free and then designers can pay for extra apps or add ons. This is not a total replacement, however. It’s meant to be a collaboration tool for teams of designers or individual hobbyists. “Software modeling has seen 30 to 40 years of development. We don’t want to compete on a feature-by-feature basis,” he said. Inside Sunglass, designers can take a 3D model and rotate, flip or scale it without Adobe Flash. It’s built with HTML5 and WebGL. The team behind Sunglass comes from MIT. DeBiswas earned his Ph.D in design computation and was a TED fellow last year while his co-founder Nitin Rao is an MBA from Sloan that started his career out in social enterprise and microfinance. DeBiswas has spent years thinking about the future of design technology. “Sunglass is a product that’s fluid enough that everyone from a kid doing a Maker Bot to a professional firm can use it,” he said. Sunglass works with more than different 40 different file formats, removing a hurdle that has long made it frustrating for designers to critique and give feedback on each other’s work. There’s also a Dropbox integration for storing and accessing 3-D files. It’s also a bit social. Sunglass users can simultaneously access a single 3D model and suggest tweaks through chat or voice chat. There’s also a sketch tool for marking suggestions. It’s easier to share 3D models with embeds like this one on DeBiswas’ Tumblr. He says that helps with virally attracting new customers. There is also an API that lets designers build tools for others. Because Sunglass is a platform play, the company is hoping that developers will eventually build specific tools that others will want on an as-needed basis. They’re not pursuing a classic monthly subscription model with one standard set of paid premium features. Instead, customers can pay for apps at a rate of about $25 a month. “Our vision for software in the future is that it will be a collection selected parts,” Rao said. “It won’t be a big company giving you a one-size-fits-all set of toolbars.” He gave an example app that does very fast cloud-based rendering. It takes about 45 seconds per object. Taking a page from Sequoia-backed Unity Technologies’ business model, there’s also a store where designers can buy one-off 3D models from others. Unity, which has a 3D gaming engine that powers titles like Shadowgun, has a store where game developers can buy 3D effects and models from other developers. Sunglass has raised $1.8 million in seed funding from General Catalyst, Sherpalo Ventures, Lerer Ventures and Maynard Webb. Q: What are the biggest technical difficulties in bringing this to the browser? And what are the benefits versus doing this on the browser? A: Most of the computation doing computation are doing it back stage. We have super computers. If you think about it one of our clients, their reactions were my client gives me large BIM files which I have no use for except that we have to go ahead and re-model. We support 45 file formats and you can drag at 3D file. We are working on technologies which will give you data on demand. We’ve taken this constraint as an opportunity. Q: Is this for professional users? Or for regular people? The presentation implies that you’ll have users who are not fluent with CAD. A: This spans from kids playing with the motorcycles above to professionals who are modeling fluid dynamics. Starting off, it’s aimed at professional designers, but it’s easy enough that you don’t need complex training. Q: Can you talk about price points? A: Bite-sized modules and apps for anywhere from $25 to 100 per month. Q: You guys are latching on to a huge trend in terms of designs. How do you help synchronous collaboration? Many of these designers don’t see themselves as early adopters. They may not feel comfortable with this or with their work in the cloud. How do you deal with this? A: Asynchronous collaboration is important. We’re working with a version where you can store a version. We have a version on Tumblr. Other people could view it on Tumblr. We have all the persistence of data on the back-end. It’s not transient. It’s not just real-time collaboration. The second thing is about behavior. Two things. We think the product has enough virality in it. I would send you a link. You don’t need a plug-in. It’s just HTML5, WebGL. We’ve made the interface light. We believe that tomorrow that software will be a collection of small pieces. We’ve intentionally kept it very simple. This has happened to every other industry. We believe it will also happen in design.